Nothing could slow Taylor Swift down, not even a heartbreak. 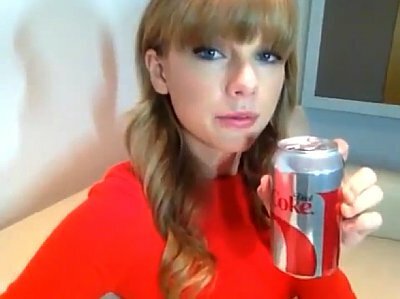 The former girlfriend of Harry Styles just got a new job, a spokesmodel for Diet Coke. The 22-year-old country/pop singer, who's famous for her slim model-like figure, announced the partnership on her official website through a video message. "I wanted to share some news with you because we're actually making it official with one of the great loves of my life...Diet Coke," the blonde beauty said. The partnership is "gonna include so many fun things having to do with the tour, having to do with Diet Coke in general, behind the scenes of the commercial shoot." In a statement, the Coca-Cola Compay confirmed that the calorie-free drink had committed to "long-term partnership with the superstar." In the press release, the company explained that the singer would "be integrated into all key marketing efforts for the brand - including advertising, retail activation, experiential and more." In late 2012, Beyonce Knowles inked a whooping $50 million deal to serve as a new brand ambassador for rival company, Pepsi. The wife of rap mogul Jay-Z scored the multi-million deal with the soft drink company ahead of her highly-anticipated performance at the Super Bowl XLVII in New Orleans.